China's main stock index rose to a fresh all-time high on Monday, with sentiment buoyed by two spectacular listings, despite a hike in bank reserve ratios announced at the weekend. The benchmark Shanghai Composite Index gained 2.17 percent to close at 3,841.27 points, the first close above 3,800. Turnover in Shanghai A shares was heavy at 188.73 billion yuan (US$24.446 billion). The central bank's announcement on Sunday that it would raise reserve ratios by 0.5 percentage point was taken as mildly positive, implying it saw no need to hike benchmark interest rates -- a harsher monetary tightening step -- in the short term. Many investors had feared a rate hike over the holiday. "The reserve ratio rise won't hurt the market a lot. The index is still in an uptrend," said Haitong Securities analyst Zhang Qi, although he added that risks remained high with the market up more than 40 percent so far this year. Every one of eight local fund managers, brokers and analysts informally surveyed by Reuters last week predicted the index would exceed 4,000 points in about a month, boosted by huge sums of money entering the market from newly created mutual funds. Two big listings on Monday showed the strength of investor sentiment. Aluminum Corp. of China (Chalco) tripled from its offer price to end the morning at 19.16 yuan, far above many analysts' expectations of 10-15 yuan. Weichai Power Co. soared 222 percent to 65.95 yuan. Chalco's leap created a massive 111 percent premium for its A shares above its Hong Kong-listed H shares , which ended the morning slightly lower at HK$9.20. This is one of the biggest A-share premiums for a top Chinese stock, and for some analysts it is another sign that the A-share market has overheated. Securities industry-related stocks soared on the view that brokerages would benefit from a continuation of the market's bull run in the absence of an interest rate hike. CITIC Securities soared 9.98 percent to 59.06 yuan. Retailing giant Bailian climbed 9.11 percent to 21.44 yuan after saying first-quarter net profit rose 44 percent. One big loser was CITIC Bank , which had soared 96 percent in a much stronger-than-expected Shanghai listing on Friday. 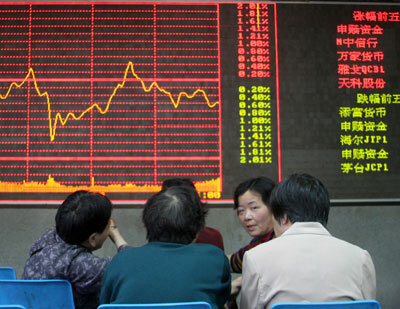 The stock tumbled 9.06 percent to 10.34 yuan as speculators took profits.